To meet Wurmpedia's quality standards, this article or section requires a cleanup by the Wurmpedia Team. Repairing woven fence requires 1.5 kg wood scraps. Each wood scrap will repair up to 10 damage depending on quality and repairing skill and uses 1.5 kg from a larger lump of wood scraps. You can open containers and take items from behind a woven fence. It is easy to destroy. The maximum quality a fence can be improved to depends on carpentry skill and wood scrap quality: (Carpentry skill + Wood scrap QL) / 2 (tested with 80 carpentry skill, and 4-8 carpentry skill on test). A few 1.5QL wood scraps for example allow improving to about 40QL with 80 carpentry. 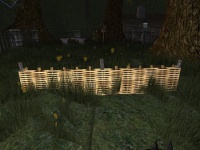 There have been reports, however, that it is possible to improve a 30QL fence at 20 carpentry skill.